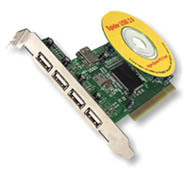 The Spider USB 2.0 Hi-Speed card is compatible with all USB devices compliant with USB 2.0 standard and with all devices compliant with USB 1.1 standard. The software support for a particular USB device is provided by appropriate Poseidon class driver. All USB devices tested with Poseidon stack work with Spider. The complete list of tested models of the USB devices (hubs, keyboards, mice, printers, scanners, ZIPs, HDDs, CDROM drivers and others) will be available in the Spider USB Devices Guide. Parts of this page are (C) Elbox and are used with permission for inclusion in "The Big Book of Amiga Hardware"